Music Express Ride is a type of self-controlled amusement equipment. The machine mainly uses the drive mode of hydraulic connected with the motor. The product modeling is novel, the topic is clear, setting sound, light, electricity as a whole. Thus, during the playing process, passengers can fully experience the speed stimulation caused by high speed rotating, as well as the sensory stimulation from sound, light and electricity. At the same time, operators can communicate with passengers on rides, fully mobilize the passenger entertainment passion. 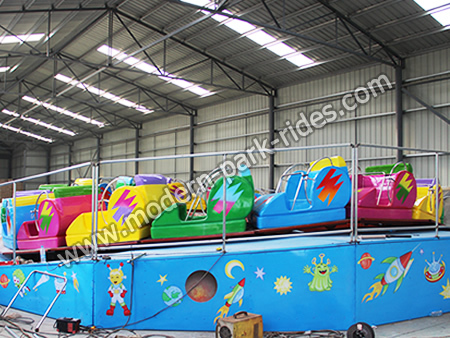 This product is mainly used in amusement parks, parks, Youth Palace, square and other entertainment places. The super acceleration when rotating, as well as the vertical and inverted rotation mode, will bring you multiple ways of stimulation experience.